Mission: The Recreational Sports Journal (RSJ) is a scholarly journal that serves to advance the understanding of the role of collegiate recreation within higher education. The RSJ publishes peer-reviewed manuscripts relevant to the holistic impact of collegiate recreation and the critical areas outlined by the NIRSA Research Agenda. The RSJ encourages empirical, theoretical, and applied submissions for publication and is produced by the NIRSA Foundation. Every NIRSA member receives an annual subscription to the RSJ. All current and back issues as well as a printed issue are available through your annual membership. Researchers and practitioners in the field of collegiate recreation are encouraged to submit their scholarly work in consideration for publication. Refer to the author guidelines when preparing a manuscript for submission. The RSJ Editorial Board has the capacity for 20 associate editors who ensure the RSJ remains a relevant source of information in the field of collegiate recreation. Qualified members are encouraged to apply for editorial board positions during the call for applications. The RSJ serves to advance the understanding of the role of collegiate recreation within higher education. The RSJ publishes peer-reviewed manuscripts relevant to the holistic impact of collegiate recreation and the critical areas outlined by the NIRSA Research Agenda. The RSJ encourages empirical, theoretical, and applied submissions for publication and is supported by the NIRSA Foundation. The Editor-in-Chief will act as NIRSA’s authorized agent in exercising editorial control over the journal and will be responsible for the selection and editing of editorial materials and their timely publication. The Editor-in-Chief will oversee the selection and appointment of Editorial Board staff. The Editor-in-Chief will work with the NIRSA Headquarters representative to determine editorial board policy and composition and to align the aims and scope of the journal with the NIRSA Strategic Plan. The RSJ Editor-in-Chief will be contracted to serve one, five-year term with the option of renewing for one additional term. The appointment will begin May 1, 2019 and will end April 30, 2024. The Editor-in-Chief will receive a remuneration of $5,000 per contract year. To apply for the position of Editor-in-Chief of the RSJ, please provide your curriculum vitae as well as a letter of intent indicating why you are interested in the position, your publishing and reviewing experience, vision for the future direction(s) of the RSJ and your significant contributions to the science of leisure and recreation studies or the profession of campus recreation. In addition, please include a letter of support from your direct supervisor who can indicate the degree to which your institution is willing to accommodate for the time and energy involved in this position. For full consideration, please send your curriculum vitae, letter of intent, and letter of support to NIRSA Research by January 11, 2019. Final candidates will be selected for video conference interviews with members of the search committee. The President’s Award for the Article of Distinction recognizes authors who have written particularly engaging and relevant articles published in the RSJ. Recipients are acknowledged with a handsome plaque during the NIRSA Annual Conference, and receive a $500 cash award. 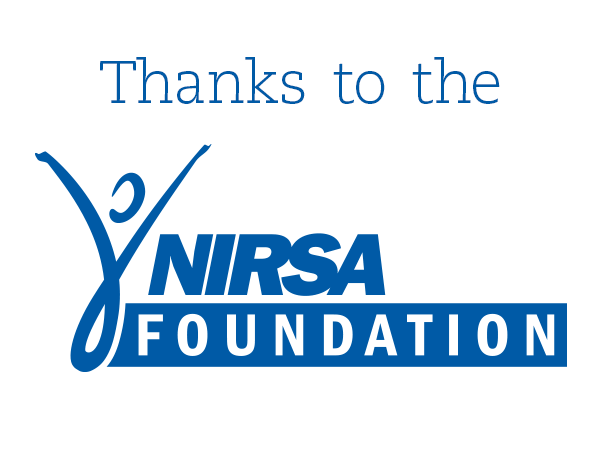 The Recreational Sports Journal is made possible by the charitable contributions toward the NIRSA Foundation.